I read many different versions of the history of Muay Chaiya, and so I was grateful for the chance to sit down with Ajarn Lek and nail some details and iron out some inconsistencies. As far as I know, Ajarn Lek is the only teacher of Muay Thai Chaiya that had the honor or learning under Master Kaet Siriyapai, so I guess he's a good person to ask! From the name, you would think that Muay Chaiya comes from the Chaiya district in southern Thailand, but in fact the founder Phor Than Ma came from Bangkok. 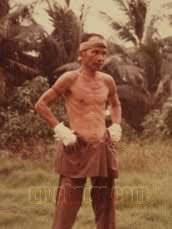 He had been the number one soldier of Bangkok in the Thai army for many years, when he retired and ordained as a monk. He traveled south from Bangkok, traveling from town to town until he reached the Chaiya district where he helped the people rid themselves of some troublesome elephants using coconut husks. This gained him great respect from the people of Chaiya, who then built a temple to be built for Phaw Than Ma to reside. Phaw Than Ma then taught Muay Chaiya to the people and specifically the governor of Chaiya, Praya Wajisata Ya Rag (Kam Siriyaphai) who then taught it to his son, Kaet Siriyapai. 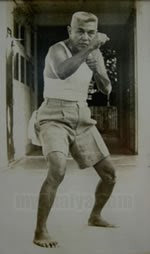 Kaet Siriyapai also learnt other styles of Muay from 12 famous teachers, the last of which was Ajarn Kimseng Tha Wi Sit, who primarily taught the Paak Klang style. He was to become the master of Muay Chaiya. Now considered one of the most important people in Muay Thai history, Ajarn Kaet taught many students. One of his best students was Kruu Thong Lor Ya Lae, who went on to make a name for himself and Muay Chaiya by fighting over 200 ring fights. Another student of Kruu Thong, Kridakorn Sodprasert (Ajarn Lek) who had already studied Muay Chaiya under Ajarn Kaet, still teaches Muay Chaiya to this day at Baan Chang Thai (House of Thai Artisans) in Bangkok.